Delightfully colourful, Joo’s makgeolli cocktails are perfect with Korean titbits. With the ascendency of K-Pop and K-Drama in Singapore, it hasn’t taken long for other elements of Korean culture to arrive onto our shores. Joo Bar, a modern Korean eatery, is a recent addition. Located on Tan Quee Lan Street, Joo Bar is the creation of two Korean food and culture aficionados, Jamie and Kristin Lim, who wanted to introduce Korean bites along with traditional Korean drinks, called makgeolli, with a modern twist. A traditional favourite among Korean farmers, “makgeolli”, meaning “coarsely-filtered” in Korean, is a whitish, milky, alcohol commonly brewed from rice. On its own, makgeolli has subtle sweetness, thin viscosity, and very faint scent. Its whitish colour is quite soothing in appearance and evokes the innocence of milk. But beware, its alcohol content is higher than beer at 6% to 8%. Recently, makgeolli’s popularity has grown in Korean cities’ hipster bars and eateries, where younger urbanites imbibe makgeolli while nibbling on titbits. Its whitish colour is quite soothing in appearance and evokes the innocence of milk. But beware, its alcohol content is higher than beer at 6% to 8%. Within the historic three-storey shophouse Joo Bar offers a variety of makgeolli home brewed using organic rice and purified water, and mixes it with other liquors for colour and flavours. 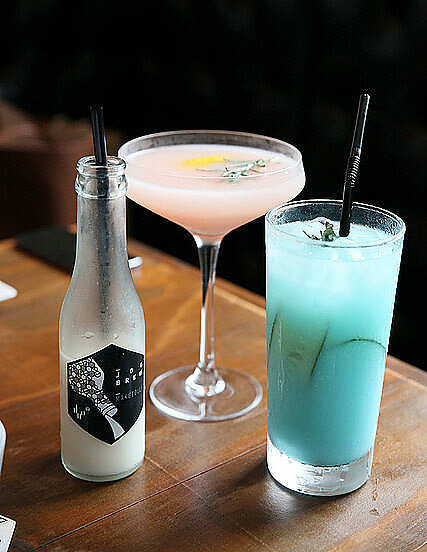 One can opt for the traditional makgeolli or any of their more creative mixes such as their Grape Soju Mojito ($14/glass), Yucha Makgeolli Slush (small, $22), or the Sojurita ($28, serves 2 to 4 people). The Yucha Sojurita was my favourite – a monster-sized glass filled with frozen soju-yuzu Cointreau-lemon juice mixed with an overturned bottle of Hite beer stuck in the middle. It reminded me of a 7-Eleven Slurpee: Sweet, slushy-cold and tasty, yet packed with an alcoholic punch. For the more curious, Joo has created speciality makgeollis – The Busan Breeze ($20), Gangnam Dreaming ($22), Hong Dae Tripping ($24) and Itaewon Freedom ($22) – each one a tribute to specific regions in Korea. Each drink comes in pretty, soft pastel colours, which immediately evoke a sense of tropical fun. For ladies who prefer the subtle presence of alcohol, these drinks are pleasantly balanced to mask the alcohol taste. It will be hard to stop at one. For $20-plus each, a night of indulgence will add up fast. So let this be a warning for budget-conscious guys who intend to bring their dates! What should follow luscious libations? Great food, of course. So it would be a travesty not to mention the food at Joo Bar. Unlike traditional restaurants, Joo’s food is designed to go well with the drinking experience. 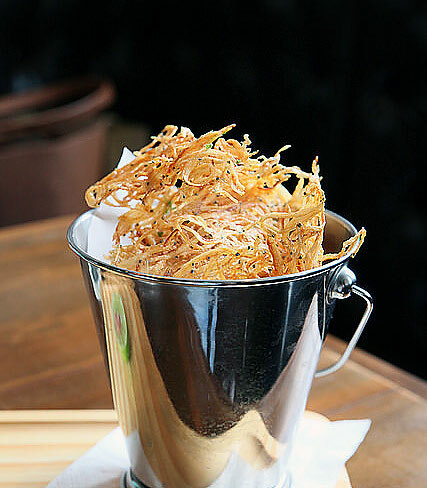 Its Baby Eel Paper ($14), which is deep fried baby eel sprinkled with chilli salt and lime zest, was a first for me. The crispiness and saltiness complemented the sweet, cold cocktails perfectly. Deep fried baby eels. Too cute to eat! 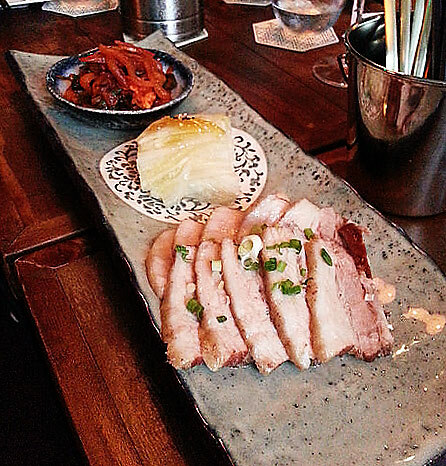 Joo also serves Mangalitsa (a breed of hairy Hungarian hog) pork belly, which was very rich and flavourful compared to our local pork belly. Order Joo’s slow-roasted ($32) pork belly served with onions, garlic and Dijon mustard with a side of spring onion salad, or the boiled ($28) version with a side of spicy radish salad and yuzu kimchi. They come in finger-friendly pre-sliced, small portions. Finally, the Warm Kimchi with Tofu and Spam ($16) defied expectations. In the past, US soldiers brought “Spam” (a type of canned meat) into Korean culture, and it wasn’t meant to be a gourmet experience. 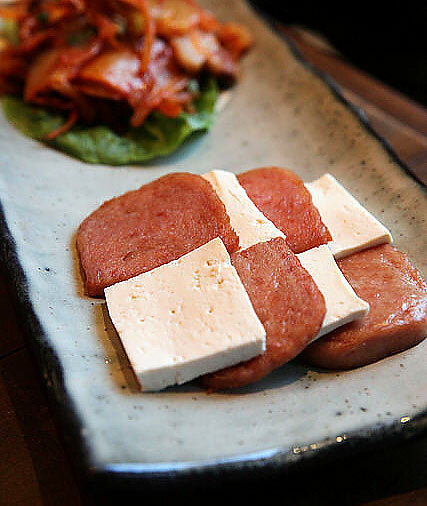 However, the way Joo interleaved the Spam with equal-sized tofu slices made it surprisingly delicate and tasty. Just to be clear, Spam is, of course, not in the same league as Wagyu in terms of pleasure of taste. But Joo’s Spam dish exceeded my expectations of this humble canned meat. Kudos to Joo.